Colorado Peak Politics | LIAR, LIAR? Was the Reason Crow Didn’t Attend Coffman’s Townhall Because He Doesn’t Live in District? LIAR, LIAR? Was the Reason Crow Didn’t Attend Coffman’s Townhall Because He Doesn’t Live in District? 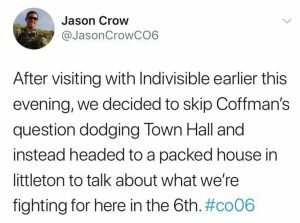 In a bizarre twist, Democratic candidate for the Sixth Congressional District, Jason Crow, has finally started to bond with the grassroots of his party, according to a tweet he sent out yesterday explaining why he did not attend current U.S. Rep. Mike Coffman’s townhall last night. First. When has Jason Crow ever hung out with Indivisible? He’d more likely hang out with Chamber Republicans than (metaphorically, relax gun grabbers) take up arms against the man. We laugh just thinking about the possibility of Crow hanging out with the (literally) unwashed masses like that. But really – was the reason he skipped the town hall because he wasn’t invited? Only constituents were permitted to attend. While Crow claimed he was moving last October, we were not invited to the housewarming party. Sad trombone. Another rumor out there was that Crow was trying to rent his place out-of-district. No word on whether he was successful. Either way, this doesn’t bode well for his campaign. Crow needs to deny his deep establishment roots to get through the campaign, but it just feels…so awkward.